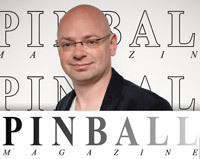 Jonathan was editor of the Dutch Spinner Magazine, published by the Dutch Pinball Association (NFV), for more than 3 years. Editing the magazine was just one of the many, often creative, things Jonathan did back then for the association. He also initiated a Pinball Donation Fund, to help the association grow its base of games. While no-one believed in the project, it turned out to be a huge success. Prior to becoming editor, Jonathan already wrote many articles and updates. As editor of Spinner Magazine Jonathan raised the bar quite a bit. When he took over in 2006 the magazine consisted of A3 sized, black and white photocopies (although the cover was in full colour), stitched and folded to A4 size. Instantly Jonathan switched to new DTP software, a new layout, a new ‘page rhythm’ giving returning features their specific position in the magazine and much more. As editor Jonathan interviewed several pinball industry designers and programmers such as Greg Freres, Dwight Sullivan, John Popadiuk, Gary Stern and others. Eventually Jonathan found a new printer and turned the magazine into a full colour magazine. Jonathan also assisted in the pre-production of IPBs Big Bang Bar, wrote (and published) a book (in 2010), did several interviews for Pinballnews.com, produced some local and international Top 40 chart hits (late 90’s) and is, as DJ Joe Nathan, still performing weekly as a successful club DJ.